The problem: the water being pumped to lathes and cutting machines caused clogging due to high levels of iron and iron bacteria, resulting in overheating and damage to expensive tools. Chemicals used to remove these contaminants also damaged the tools by causing pitting, which resulted in high maintenance and replacement of equipment. 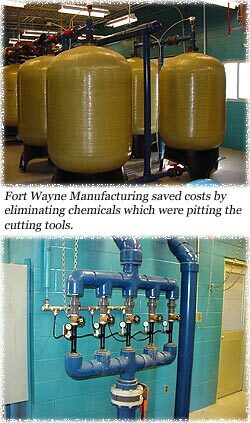 With the installation of the CleanWater Ozone system, the iron and iron bacteria were removed before the water reached the cutting tools. This eliminated the clogged water lines; no pitting occurred due to the elimination of chemicals. The system has been operating efficiently for over seven years.